Right now on FineStationery.com, fall into the holidays with 15% off your order of $100* or 20% off your order of $150* or more with promo code WONDERFALL. With a sale this good, it's hard to pick what you'll want. We've rounded up our top 5 picks to guide you. Top left: Fashion Week Note Pad by Carrie Beth Taylor - As the weather cools down, its time to grab our coats! We love this ultra chic note pad that features amazing watercolor detailed illustration from artist Carrie Beth Taylor, complete with stylish jacket, quilted clutch, and leopard heels. Add your name to make this the ultimate fashion statement. Bottom left: Silver Foil Garden Flat Card by Real Simple - Send a little bit of love with these darling silver foil pressed note cards from the new Real Simple stationery collection. We love this design because it is simple and can be used year round. Personalizing your name on the card with digital printing makes these foil stationery sets affordable and adorable. Center: Assorted Letterpress Box Set by Rifle Paper Co. - This set is an essential personal office must have! With 6 different designs for every occasion (birthday, thank you, everyday, love, congratulations, and thinking of you) you will be the most prepared and thoughtful friend around. The thick cotton woven paper and elaborate letterpress hand drawn designs by Anna Rifle make these a great gift to receive in itself! Top Right: 2015 Desk Calendar by Stevie Streck Designs - A favorite in the FineStationery office and with our customers, this desk calendar is the perfect add on to dress up your desk! Each month features a new design related to that time of year, accented with touches of glitter. A folding easel makes it easy to prop up on a table and display. This makes a perfect gift for anyone with a desk in need of some pizzazz! 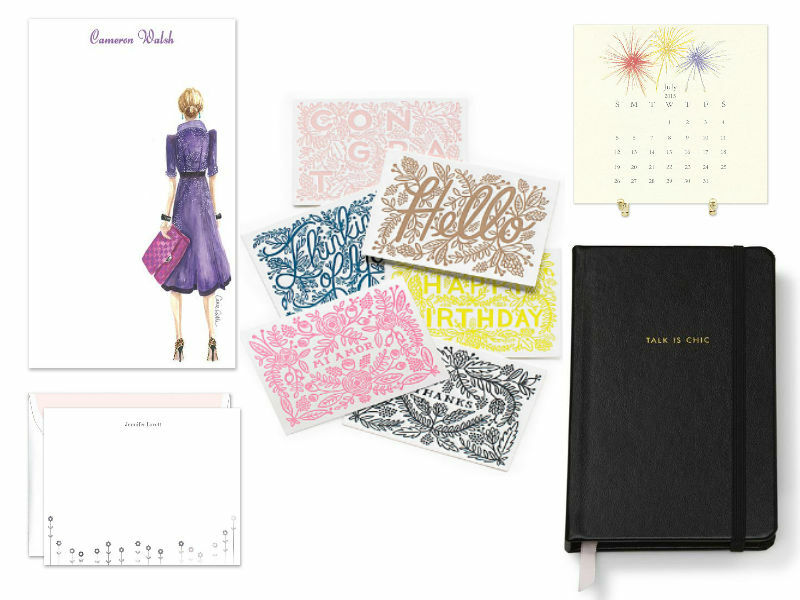 Bottom Right: Talk is Chic Mini Journal by Kate Spade - The perfect accessory for anyone on the go. Brainstorming, sketching, and making to-do lists are all made easier with this mini notebook that can be with you at all times so you never forget a thought. The gold foil saying "Talk is Chic" is playful and the black cover makes it go with every outfit! The Fall into the Holidays Sale ends 10/12 (Sunday!) at 11:59pm EDT. Don't forget to use promo code WONDERFALL to save on these great items and everything else site wide!